Are you usually the friend who lays down the law? Who makes the rules? Better yet, are you the one who constantly finds yourself between friends helping them hash out arguments? We know the type. You're a peace-maker. An arm of justice. If this is the case, then we've got just the outfit for you. Because, to us it sounds like you're more than just an enforcer. It sounds like you make judgment calls. No, it wasn't his cookie and he shouldn't have touched it. Yes, she did yell too loudly and should be more considerate. So-and-so should definitely apologize... do any of these sound like you? We thought so. You're definitely Judge material. So if you're going to go around settling disputes between friends, making judgement calls, and telling people how to fix things, you should at least look the part. That's where our Adult Judge Costume comes in. This is a 100 percent black polyester robe that zips up in the front. Wear it over a dress or suit just like the real judges. 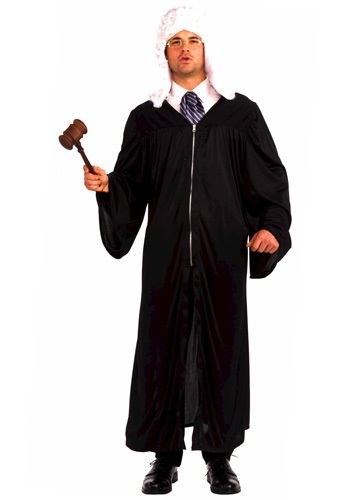 Find yourself a ridiculous wig and big wooden gavel. Look judgmentally over your glasses at your friends. Give your friends a reason to call you "Your Honor." It's sounding better and better by the minute, isn't it? We thought it would. The verdict is officially in on this outfit and the jury agrees: it's definitely a win.